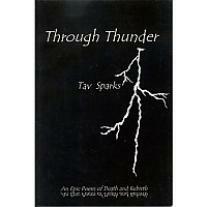 In the midst of his stormy years and dark night of the soul, twenty years ago, Tav Sparks spontaneously wrote this “epic” poem, Through Thunder. Epic spiritual poems in ancient literature provided experiences in their times akin to our most profound experiences of film today. Through the poet-director’s image, sound, and emotion, the reader or listener might find connection to inspire or affirm both the struggle and the transcendence. Through Thunder begs to be read aloud. It feels and sounds us through the archetypal “Hero’s Journey” described by Joseph Campbell. It draws the perennial, turbulent, death-rebirth map of psychospiritual awakening, a process experienced by the mystics of all religions and an archetype very present in our world today.